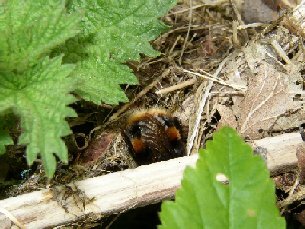 Bumblebees are the big furry bees that you see in the garden and countryside in the late spring, summer and early autumn. They have evolved in close relationship to flowering plants; flowers and bumblebees are completely interdependent. Flower shape, colour, scent and flowering time attract bees of particular types; the flower is pollinated and can then produce seed and reproduce. In return the bee receives a reward of food, pollen and/or nectar. Blue flowers tend to provide nectar; yellow flowers tend to provide pollen. The dominant spring flower colour of yellow provides pollen, the protein source for baby bees as the nest builds up and bee numbers increase. Summer blues and pinks provide nectar; the energy source for adult bees and the source of honey. 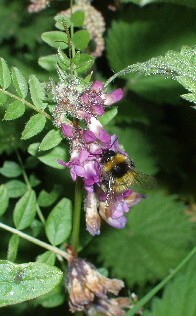 Flower shape attracts bees and some flowers such as vetch even provide landing platforms for the bees. Bees have evolved as flowering plants have evolved. Their furry coats keep them warm in cool weather and the hairs become covered in pollen, which is then moved from flower to flower.